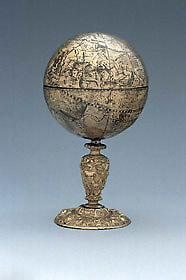 This small celestial globe is centred on the poles of the ecliptic. The constellations are named and their figures engraved, and different star symbols are used to distinguish six stellar magnitudes. The two hemispheres of the globe can be separated and inside the northern hemisphere is a scaphe dial for common and Italian hours.